The penultimate day of July – one of the better-weather days in what was a poor month – saw a wander over Beinn Dorain and Beinn an Dothaidh with a couple of chess-Munroist pals. Just a standard kind of outing from the Bridge of Orchy side, nothing fancy routewise: into the main corrie, sneaking up rightwards from below the main col to meet the Dorain ridge at the lochan on the shoulder, then along to the summit, down to the col and a clockwise circuit of the three Dothaidh tops as the sun came out and the breeze dropped. It was perhaps this improvement in the weather – always nice with views to Jura and Mull, but better in the second half of the day as the high cloud broke up – that accentuated what a pleasant hill Beinn an Dothaidh is and made me realise, not for the first time, that I prefer it to its higher and more celebrated neighbour to the south. There’s no doubt that Beinn Dorain is the better known of the pair, with its symmetrical shape as seen from the south being classic calendar fodder, plus it has one of those old Gaelic poems written about it of the type that guidebook writers and columnists always seem obliged to mention but which hardly anyone actually knows. Beinn an Dothaidh doesn’t have any of this – even the railway takes a less spectacular line on approach, crawling round the base of the hill rather than swaggering photogenically towards it across a viaduct – but it does arguably have nicer walking on its upper slopes and there can’t be much dispute that it has better from-the-top views. The section between the west top and the central summit – across a tilted grassy meadow, skirting the edge of the big north-facing gully (still harbouring a chunk of old snow on the late-July trip) and with balcony views towards Loch Tulla and Rannoch Moor – is a more pleasant experience than the stony, heavily eroded stretch up the northern shoulder of Beinn Dorain and so to its summit via the notorious false top of Carn Sasunnaich. The view from the 1076m cairn is good when you get there, but that from the 72m-lower one on Beinn an Dothaidh is better. I’ve been on both hills – and the rest of the group of five Munros – a fair bit over years, with the recent outing having been my fourteenth time up Beinn an Dothaidh and ninth up Beinn Dorain (or 9.9th given that the first visit, a cartographically clueless middle-of-the-night effort in 1985, saw me arrive at Carn Sasunnaich in cloud and become not the first and surely not the last to fail to realise there was higher ground further along). All sorts of combinations of these Auch/Orchy Munros are possible. I’ve not done all five together but have managed various threes and fours (plus a linking of Beinn Mhanach and Creag Mhor on either side of Loch Lyon) and, as so often, the less obvious ways up tend to be the more interesting ones. The north-east ridge of Beinn Dorain – or rather of Carn Sasunnaich, as it meets the main spine at that summit rather than at the higher one – is an improvement on the Bridge of Orchy approach, interestingly rough and giving views of the huge rockfall in the upper corrie. I’ve also been up that side of the hill in winter conditions, and have had another good day – in summer – on the long south ridge which has a useful little gully just where you want it as a means of getting through the craggy bit near the top. But for all that these have been worthwhile routes and good days, I still prefer Beinn an Dothaidh to Beinn Dorain overall. Perhaps it’s a getting-older thing – and certainly a case of gradually working out what one prefers in hill terms and thus tending to cut the cloth accordingly – but these days the places I like most are often steep-sided hills with meadow-like grassy areas on top. Others will of course favour different types of hill – and I enjoy sharp-summited and knobbly things as much as the next person – but the best ones in my book tend have steep flanks shoring up stroll-about spaciousness. The Lake District has several of these: Grasmoor is a good example, while part of what makes Blencathra such an enjoyable outing is that a scramble up one of the ridges lands you on the easy-going plateau where the whole mood and feel of the fell changes. There are other pairs of the general Dorain and Dothaidh type – Ben Vorlich and Stuc a’Chroin for instance, with Vorlich fulfilling the Dorain role and Stuc the Dothaidh one, or Bidein a’Choire Sheasgaich and Lurg Mhor – while another variation is the big broad plateau next to a smaller knobblier thing, like a supertanker with a tug drawn up alongside. Beinn Fhada and A’Ghlas-bheinn fit this format, or Geal Charn and Creag Pitridh – and again my preference is for the flat-topped one of the pair. It could be argued that this kind of analysis – who prefers which in any odd-couple pair of hills, and why – provides an insight into character generally, as such things run deep. It also reflects the overall east-west divide that forms such a feature of Highland hillgoing: eastern plateaux versus western pointiness, broad upland acres versus narrow ridges. Of course there are also plenty of hybrid lumps which tick both boxes or neither, and hillgoing is very much a case of taking what comes as you find it and avoiding too much theorising, but in terms of simple definitions there is surely a meall versus sgurr divide of sorts (and for all that they’re actually both beinns, the Bridge of Orchy pair could have ended up as Sgurr Dorain and Meall an Dothaidh; 50 miles further north and they might well have done). Of course this kind of thing doesn’t come into play anywhere near so much for the masses of people engaged in linear bagging, where the set of hills is fixed and the choice is really just what order to do them in and how long to take. Picking and choosing what one does or doesn’t like is more the domain of the repeaters, the retired baggers and the general potterers (and I would admit to having a foot in all three of those camps, not that I have three feet). Another reason why I prefer the Dothaidhs of this world over the Dorains is simply the scope to stay high for longer and thus get more value for having slogged up there in the first place. A prime example of this occurs on my local patch, where Dumyat (steep and craggy with a small summit area) is quite a bit closer to where I live than the main Ochils further along the A91 (brutally steep hills low down then opening out into grassy plateaux and broad ridges). I’m up Dumyat every month or so, right enough – it’s too interesting and too handy to avoid – but it’s the further-away main stuff that sees me pretty much every week. Once you’re on Ben Cleuch, say, or Tarmangie, then you can stay high for ages with only slight drops on good striding-out terrain; conversely, with Dumyat, once you’re up you’re up and it’s then simply a case of heading down again. There is the bonus bump of Castle Law (which perhaps only one in every 500 Dumyat summiteers will visit), but other than that there’s no scope for keeping the hard-earned height. 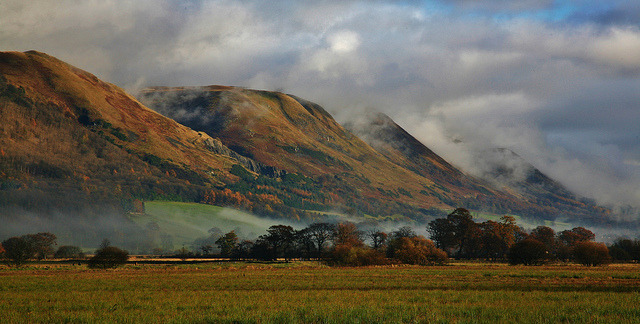 The main straggle of 600m Ochil summits has a sense of space and escape and proper-hill-ness that Dumyat – with just its tiny nugget of ground above 400m – simply isn’t high enough to provide. The same kind of thing applies to the Pentlands: fine hills for sure, and serving much the same “urban lung” purpose for Edinburgh folk as do the Ochils for people in Stirling area. But with the Pentlands being 150m lower than the Ochils, and having a considerably higher start for the most part (the Hillend car park is about 230m and Eight Mile Burn 270m, while Alva and Tillicoultry are both about 50m), there isn’t the same sense of getting away from it all that the main Ochil ridges and glens are able to provide. Of course other people will have different preferences in such matters – and thank goodness for that, as life in general already has too many orthodoxies and too much pressure to conform to what is deemed good or worthwhile. It’s a vital feature of hillgoing that it takes all sorts, and having to take the rough with the smooth in terms of terrain and weather is a crucial part of that. It doesn’t do to get too choosy, after all. But for me, as I get ever older, for all that you might occasionally bump into me in a pointy/narrow/rocky place such as Cruachan or even the Cuillin, it’s much more likely to happen on the Whitewisps, Grasmoors and Beinn an Dothaidhs of this world. I mentioned chess-playing Munroists earlier, and it seems to be quite a popular combination of pastimes. The Stirling chess club, where I toil to no great effect on Monday evenings for nine months of the year, has three actual Munroists plus two other members (out of only 20 or so in total) with upwards of 200 Munros accumulated – plus one former member has been round all the Munros and Corbetts. Other clubs have active hillgoers as well, and there has been sad news in this regard of late as one of the two people missing – and not, at the time of writing, found – in Glen Nevis is Tom Brown, stalwart of the Lanark chess club. He disappeared early in June and his rucksack (seemingly containing his tent, although there have been conflicting reports about this) was found a few days later east of Old Steall, but despite extensive searches by Lochaber Mountain Rescue Team there has been no sign of him (nor of Eric Cyl, who vanished in the same area in May). I wouldn’t claim to really know Tom Brown – we were more at the nodding-acquaintance level – but he has long been a familiar character on the Scottish chess scene, a friendly, earnest man with distinctive bushy eyebrows. The last time I saw him was in late March, when the final round of the Scottish National Chess League was held in Dunfermline and he was playing for Lanark. We met over the board in 1995 when he was with Carluke and I was with the Battlefield outfit in Glasgow (both clubs are now defunct), and I well remember the occasion as Tom put a stop to the longest unbeaten run of league games I’ve ever had. That appears to have been our only encounter, even though there was scope for us to play again – more likely in weekend congresses than in club matches, given that we ended up in different leagues – as we were of roughly the same standard although he was always a bit stronger than me. I didn’t know he climbed hills until he went missing and various details – such as a half-completed list of the Lochaber Munros – emerged during the initial search. As always when someone from one of your interest areas unexpectedly comes to grief in another, news of the disappearance came as quite a jolt. A body has not been found, so there is still a chance of hill days to come and of future chess encounters, but it feels like an outside chance now: with so much time having elapsed it’s hard to see how this can have a happy ending. It doesn’t do to give up, however – and as things stand there is still hope, albeit faint, of positive news via some unexpected turn of events.